A few months ago I was producing a talk radio show on one of the most listened to mid-morning radio shows in Gauteng, South Africa. The first hour of the show is an open line, where listeners can reflect on some of the stories that have made headlines in the previous day and share with us what they think are solutions to our country’s pressing challenges. An old man, Mandla, called into the show and wanted to share his story with our listeners. What followed was the epitome of what responsive leadership means to me and a testimony that leadership isn’t exclusively for people in positions of power, but applies to every one of us, regardless of age, profession and title. Mandla went on air and shared with our listeners that he is disabled, uses an old wheelchair that needs to be serviced; that he lives in a shack and doesn’t have access to running water and electricity. He added that he doesn’t have anyone to take care of him and often goes for weeks without bathing. He started weeping, as he shared his heartbreaking story on air. As he was on air, the Member of the Executive Committee (MEC) of Housing in Gauteng called into the show saying he was concerned about this and wanted to provide assistance, where his office can. In addition to this, the MEC agreed to an exclusive media walkout of the area that Mandla lived in, to inspect the community’s living conditions and arrange for the necessary upgrade where needed. A few moments later, the local Councilor in the area where Mandla lives called in and said they would provide groceries for him and have them delivered to his shack. While that was happening on air, one of our regular listeners called in and also wanted to assist. He committed to hiring and paying for a nurse to take care of Mandla. He mentioned that he’s not rich or in a position of power, but has the means to assist by paying for the nurse - that it was the least he can do. A week later, I followed up with the different parties to check if they had delivered on what they committed on. Responsive leadership has no title, no age group and has very little to do with whether or not you are an elected official or CEO of a company. Responsive leadership is our ability to take action and actively play our part in our communities. This includes the caller, who is touched by what someone in his community is going through and commits to assisting, to the elected councilor, stepping up, taking responsibility of where he and his office may have erred or failed someone in need. Responsive leadership, in many respects, is us recognizing that leadership is a verb and not exclusive to people in power. We can create a more inclusive society, by firstly dismantling this idea that only people in power, or people of a certain age, or worse, a certain gender are leaders. We’re often taught from a young age that ‘leadership’ is a male trait. This disempowers young girls, who grow up to be women, who don’t take ownership of their leadership potential, and often seldom live up to them. I’ve already started shaping the world I live in, that puts responsible and responsive leadership at the forefront. I’ve co-founded the Thabo Mbeki Foundation Youth Hub, a leadership organization that’s a vehicle for young people who are, or want to be involved in leaving a positive legacy in Africa. I continuously push the boundaries of what a woman is expected or not expected to do, often sharing my leadership story and some of the challenges I had living up to my leadership potential. Responsive leadership for me means taking responsibility for my role in building the society I want to live in and mostly importantly, it’s recognizing that more can be done, if we work together as a collective, as opposed to alone. Today, Mandla has the support he didn’t have a few months ago. That happened because we all played our collective part in making it happen, something that can be done at a township level, right up to a global level. That’s what it means to be a responsive leader. 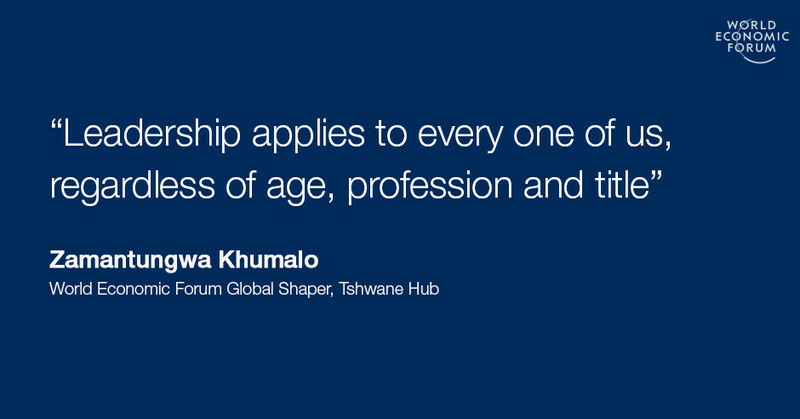 About this article: Zamantungwa Khumalo is a World Economic Forum Global Shaper. Her article is the winning entry in the 2016 Global Shaper essay competition on the theme of responsive and responsible leadership.